This is probably the quickest pasta you will ever make from scratch. The sauce can be whipped up while the pasta is cooking. The avocado adds a wonderful creaminess to the sauce. I love how there is no cooking involved in making the sauce. I mix it up in my immersion blender but you can also use a regular blender or food processor. This pasta is best served immediately. If you aren't a big fan of garlic you can reduce the amount used. This pasta had a lot of sauce. You could probably increase the amount of pasta but I like a lot of sauce. I prefer this with rotini or fussili. I hope you will give this a try...you will be surprised how yummy it is for so little work! While the pasta is cooking, add oil, lemon juice and garlic to an immersion blender and puree (you can also use a blender or food processor). Add the avocado and salt and process until smooth. Once you pasta is cooked, reserve 1/2 cup of the water the pasta was made in. 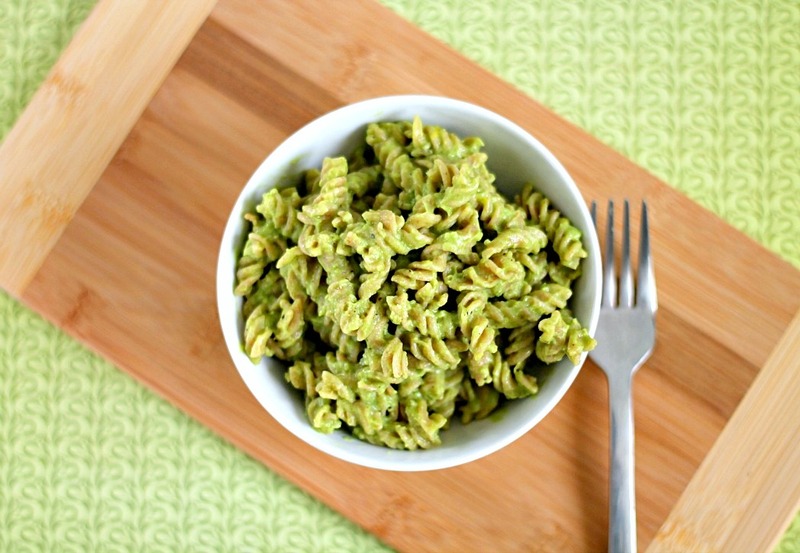 Add some of the pasta water to the avocado sauce to get to your desired consistency. Drain the pasta. Mix the pasta and sauce. Garnish with lemon zest and freshly ground black pepper. Serve immediately. love this creamy one..looks so delicious.. This is perfect, love the creamy green sauce! I love avocado in any form, but have never had it on pasta like this. Looks delicious! One thing that's missing...how many servings does this recipe make? I have 6 people, so I'm wondering if I should double the recipe or not to feed us. :O) Thanks! I prefer not to put the amount of servings b/c it really depends on the person/family. Some people are big eaters and some not. For our family this would be 2 servings. I like avocado and garlic so I know I'll like this easy recipe. Thanks. I loved this pasta recipe from Oh She Glows.. it was brilliantly done. Nice job!